OH, goody! I wasn't sure if we'd be seeing you at all, much less this soon! 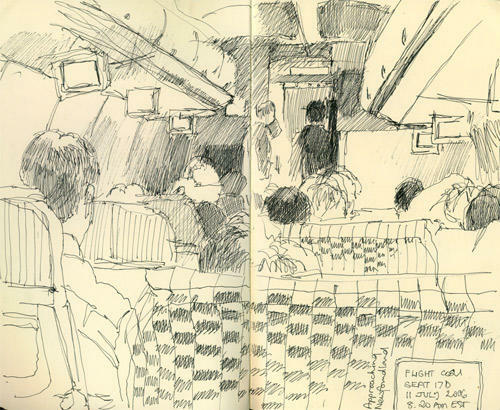 What a great sketch of the plane's entrails--my similar ones are much less clear. I think your chair has great instincts ;D. Hope you and it are reunited soon. Keep drawing and posting! Teehee! I know! When they told me where it had gone I just knew it was going to get a mention in the blog and what you'd say! I should be fine for posting this first week as I'm based at my friend's house. After that it's going to depend on what facilities I can access. The main problem is going to be lack of a scanner. They should have artists' internet cafes in every town, complete with scanners, large screens, apple macs loaded with the complete adobe CS2 software suite and corel painter! Welcome to the USA Katherine!! Of course I'm over here on the east coast, I've never even been to California, so I'm eagerly looking forward to your sketches! Glad you arrived safe and sound! It's been non-stop since I got here hence no time to post and more although two paintings and several sketches should be appearing on a blog post sometime soon hopefully! Nice sketch. I'm leaving myself from Redwood City (just outside San Francisco) to Chicago for a few days. I'm brining a small watercolor kit. Hope to have something interesting to post. Hope you're having a great trip, and my suggest sketching spots between San Francisco and LA are worthwhile. Katherine - All I can say is what a treat it will be when you are able to post again! You must have so many sketches. I keep checking in - hopeful - but obviously the technology has frustrated you, so will look forward to your arrival home and many hours of posting. I travel a lot with notebooks and don't know how to draw. I loved your sketch. NM and the SW are great places and things to sketch. I look forward to the sketches.